Gift certificates are not valid until payment has been received and successfully processed by Oasis Day Spa. Oasis Day Spa reserves the right to refuse service or reverse any gift certificate purchase for any reason and return the funds to the purchaser. These terms and conditions also apply to spa gift certificates purchased via SpaEmergency.com and JoyOfSpa.com from Oasis Day Spa, which is listed under Baltimore Area Spas and Columbia, MD Spas. Gift certificates are only redeemable at Oasis Day Spa for the amount or service specified on the gift certificate, by the expiration date indicated. Oasis Day Spa reserves the right to convert service-based gift certificates to their monetary value, equivalent to what was paid for the gift certificate, at its option and sole discretion. Oasis Day Spa, its agents and vendors, may provide gift certificate purchasers with information about the redemption status of gift certificates. Oasis Day Spa reserves the right to immediately invalidate gift certificates, without notice, should it receive a credit card chargeback, returned check or other form of repudiated payment made towards the gift certificate. Oasis Day Spa is not responsible for lost or stolen gift certificates. Reasonable and prudent steps are taken to verify the legitimacy of a redeemer and upon full redemption or at the expiration date, the gift certificate will be identified as not valid for payment of any kind. Oasis Day Spa reserves the right to dishonor the gift certificate, if it reasonably believes it was not validly purchased, has already been redeemed, or the redeemer stole or is otherwise not the intended beneficiary of the purchaser. Oasis Day Spa will replace a valid lost gift certificate, provided the original gift certificate hasn't been redeemed and the replacement is issued to either the original purchaser or a verifiable recipient. Oasis Day Spa reserves the right to contact gift certificate purchasers, or known recipients, to remind them of upcoming expiration dates. Oasis Day Spa reserves the right to change these Terms and Conditions from time to time in its sole discretion. Oasis Day Spa is not responsible for emailed gift certificates that do not reach their intended recipient for reasons beyond its control. Bounced email is not monitored. Receipt of email cannot be verified. Oasis Day Spa can only verify receipt of the gift certificate, if the recipient of the gift certificate actually uses the URL enclosed in the email message to access the gift certificate using an internet browser. Between 1am and 6am, MST, Oasis Day Spa processes future email delivery requests and ships out previously scheduled email. 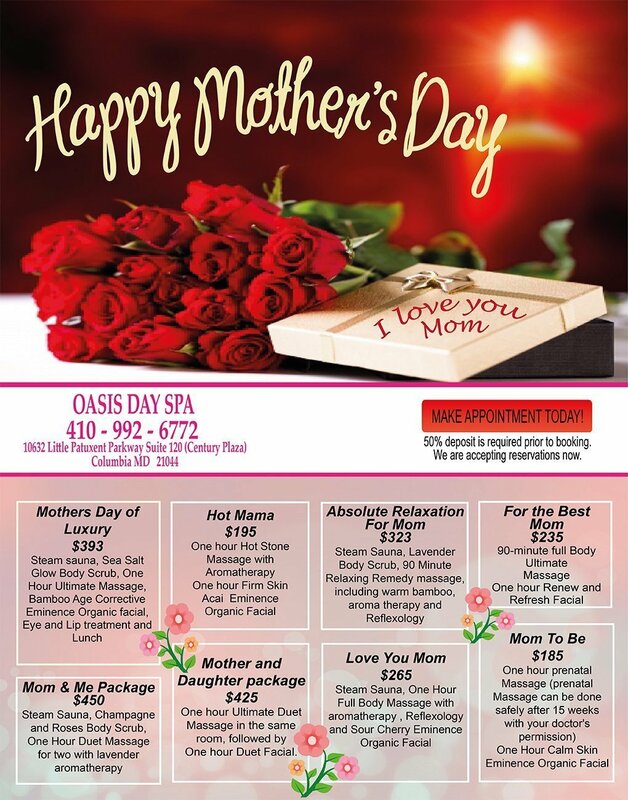 Oasis Day Spa is not responsible for late delivery of gift certificates. OASIS DAY SPA, ITS AGENTS AND AFFILIATES, MAKE NO WARRANTIES, EXPRESS OR IMPLIED, WITH RESPECT TO GIFT CERTIFICATES, INCLUDING WITHOUT LIMITATION, ANY EXPRESS OR IMPLIED WARRANTY OF MERCHANTABILITY OR FITNESS FOR A PARTICULAR PURPOSE. IN THE EVENT A GIFT CERTIFICATE NUMBER OR BAR CODE IS NON-FUNCTIONAL, YOUR SOLE REMEDY, AND OASIS DAY SPA'S SOLE LIABILITY, SHALL BE THE REPLACEMENT OF SUCH GIFT CERTIFICATE. Gift certificates, and these Terms and Conditions, are subject to and governed by the laws of Maryland, without reference to its principles of conflicts of law.